The route to Russia in World War Two was particularly harsh, it was even worse in winter, as Convoy PQ13 found out. Two weeks after leaving Scotland on 10th of March 1942, the convoy was scattered by a storm, which lashed the ships for four days. The Germans of course lost no time in capitalising on their good fortune with submarines and aircraft attacking the merchants. Three Narvik class destroyers were sent to hunt the convoy down. These were Z24, Z25 and Z26. They first stumbled upon the SS Bateau, which they sunk. Of the 47 crew on board only six were rescued. Ploughing through a heavy snow storm on the morning of March 29th the crew of Z26 saw another large ship appear in front of them, just 4000 yards away. Suddenly the ship spouted fire. It wasn't another victim, it was the Crown Colony class cruiser HMS Trinidad (motto "Have Faith"). 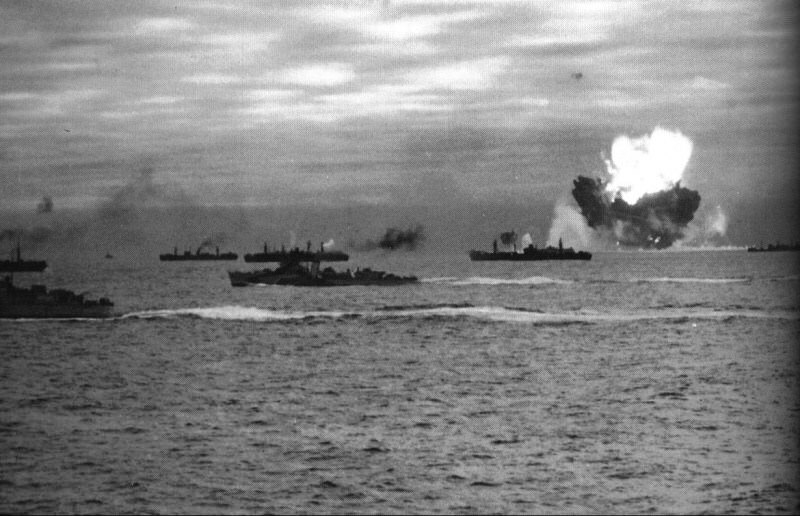 Using her radar, she had picked up the closing destroyers and moved to block them from attacking the convoy. When she ran into Z26 she was fully armed and alert, and began to pummel the unlucky Z26. After only a few salvos the destroyer Z24 emerged from the snow and launched a torpedo attack at HMS Trinidad. The appearance of Z24 gave Z26 a respite as HMS Trinidad was forced to dodge the torpedoes and switched fire onto her new attacker. The two Germans managed to hit HMS Trinidad with a few shells which caused a small fire, which was quickly controlled. Z24 broke contact with the British cruiser, but Z26 was not so lucky. 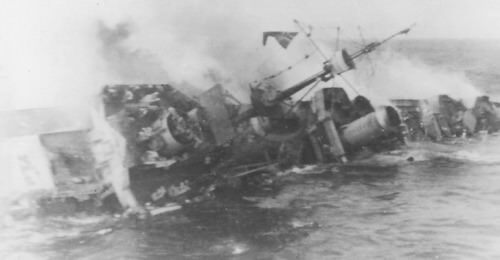 She was quickly chased down by HMS Trinidad and HMS Eclipse, a destroyer, and shelled until she stopped. The cruiser moved in to finish the German with her torpedoes, after they were lined up the crew in charge of the torpedoes opened fire. Two of the torpedoes failed to launch, frozen into their tubes by the bitter cold. Z26 was then sunk by gunfire. 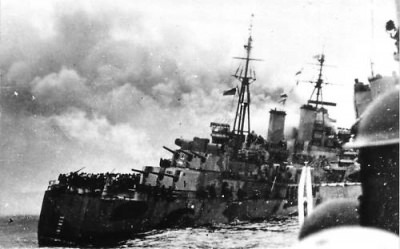 Of her compliment of 240, only 96 were rescued by the other destroyers after the battle. On HMS Trinidad, suddenly there were cries of warning about a torpedo track in the water, heading right for her. The torpedo slammed into the cruiser on the port side near the bridge. It ripped a massive hole in the side of the ship, flooding the forward boiler room, and setting fire to her as well. The torpedo was later determined to have been a British one, the same one that had been fired at Z26. Its gyroscope had malfunctioned in the cold and drawn a giant semi-circle, which by incredible bad luck had managed to hit the ship that launched it. This impact caused he loss of all power, and killed 32 of the ship’s company. The bodies were not recovered until in port, and were later buried at sea by the British minesweeper Niger. HMS Trinidad was taken under tow until the damage control measures restored power and she was able to limp into Murmansk on her own on the 30th. What followed was a month of repairs, with the repairs being completed on the 2nd of May 1942. It’s an interesting, if ill-fated piece of news, that the replacement steel plates used in repairs were brought to Murmansk by HMS Edinburgh, before she returned to the UK to load up on another type of metal for her final voyage. 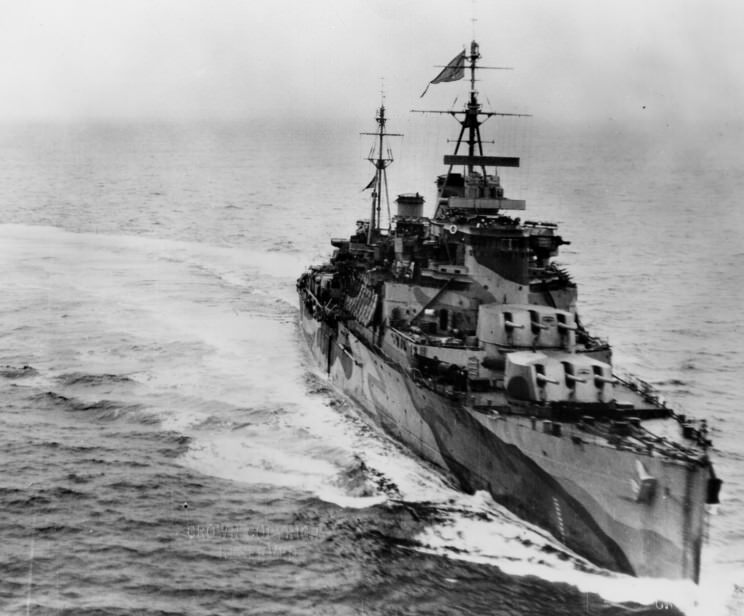 After HMS Edinburgh was sunk twenty of her survivors were to hitch a ride on HMS Trinidad on her return journey, which began on the 13th of May. She was accompanied by HMS Foresight, Forester, Somali and Matchless, the first two destroyers were veterans of the HMS Edinburgh's sinking. The journey was to take longer than normal as HMS Trinidad was limping along on just one boiler room, and so was reduced to just 20 knots speed. Two days later, on the 15th, the group of combat ships came under attack by a force of some twenty Ju 88 bombers. The ships began to fire with everything they had. The captain of HMS Matchless kept station with HMS Trinidad. He had four signallers spot bombs. When a bomb is falling its target often losses sight of it, and so the observers on HMS Matchless were able to flash warnings of bombs that looked like they might hit allowing HMS Trinidad to zigzag out of the way of the danger. One bomber made a dive bombing run on HMS Trinidad, missing the target aft, but as they flew away the crew hosed down the upper decks with its machine guns, all to no effect. 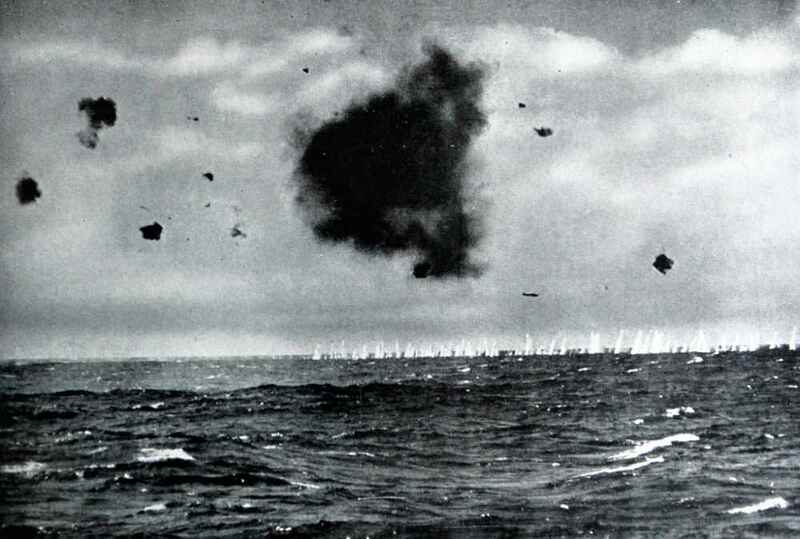 Then torpedo bombers came in, HMS Trinidad nimbly dodged the torpedoes, all the time flak blasting from her guns. Her luck was not to hold, one of the last bombers managed to score a hit on her. The bomb penetrated deep into her hull, near the torpedo damage. The bomb exploded where the passengers were sheltering killing them all. It also caused the seal over the torpedo damage to break, and HMS Trinidad began to take on water, and started a major fire. With all this damage the decision was taken to abandon ship. The wounded and crews were divided into lots and evacuated one by one on the destroyers. This was particularly dangerous for the little ships, as the raging fires were nearly at the A turret magazine. Before the last group was taken off a new string of signal flags was raised on her masts, which read ‘I Am Sailing to the Westward’. With the captain of HMS Trinidad the last to leave her decks, HMS Matchless was ordered to sink her with torpedoes, which she duly did. 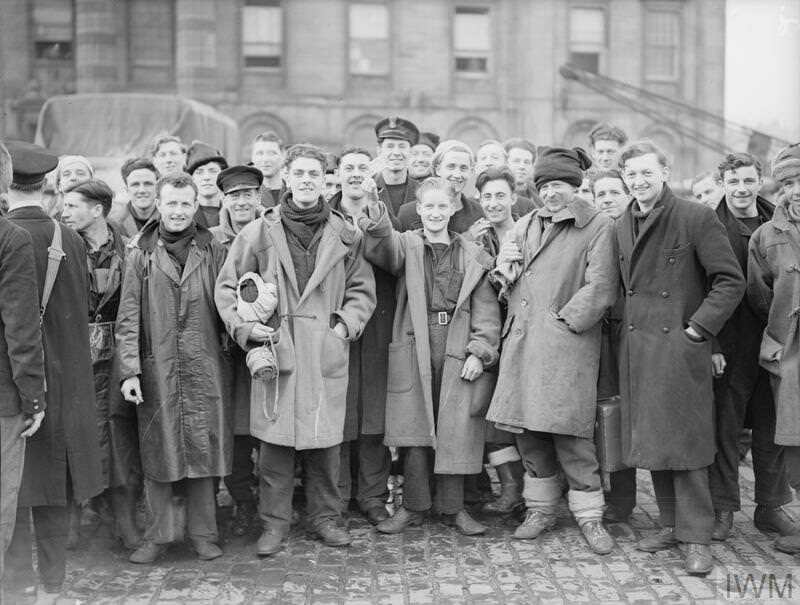 HMS Trinidad survivors in the UK after their return. The escorts then came under heavy German air attack and a running battle ensued, the hard pressed destroyers under constant attack for many hours. Then suddenly heavy shells started to burst amongst the circling bombers. The destroyers had lured the bombers into range of the covering force, which consisted of the cruisers HMS Nigeria, Kent, Norfolk and Liverpool, along with a screen of escorts. The concerted fire-power caused the Luftwaffe to retreat, and the survivors of HMS Trinidad made it to the UK safely.